President Donald Trump is hitting the European Union with steel and aluminium tariffs. 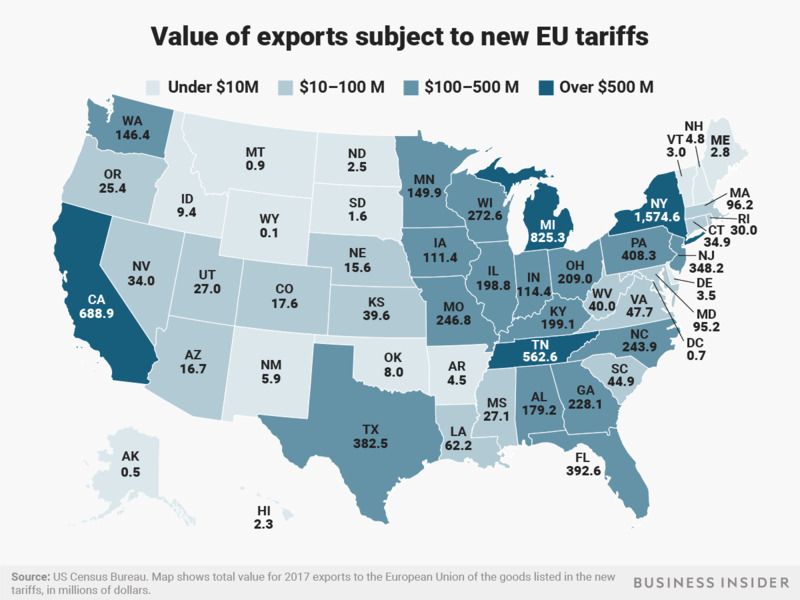 The EU retaliated with a list of tariffs on over $US7 billion worth of US goods. Using US export data, the states that would lose the most are New York, Michigan, California, Tennessee, and Pennsylvania. As President Donald Trump attempts to smooth things over with key allies at the G7 summit in Canada, those same allies are moving forward with tough retaliatory trade penalties against US goods. Among the allies striking back at Trump’s steel and aluminium tariffs is the European Union. The EU announced tariffs on just over $US7 billion worth of US goods on Wednesday on goods ranging from industrial steel to rice to flip-flops. The list of goods subject to the new EU tariffs was carefully selected to send a political message to Trump and congressional leaders while also minimising the damage on EU consumers. The tariffs will also not hit every state in the US equally. On opposite ends of the spectrum, New York sent over $US1.5 billion worth of tariff-eligible goods to the EU last year while Wyoming sent just under $US100,000 of tariff-eligible goods. Following New York, Michigan is the second-hardest hit state with $US825 million worth of exports now subject to tariffs. California ($US688 million), Tennessee ($US562 million), and Pennsylvania ($US408 million) round out the top five most vulnerable states. For a few of the top states, the bulk of the hit comes from just one product. For example, over $US1 billion worth of New York jewellery will be subject to the tariff, roughly two-thirds of the state’s total. Whiskey is the source of most of Tennessee’s troubles as the liquor makes up just over $US466 million of the state’s $US562 million total tariff-eligible goods. In Michigan, roughly $US674 million of the total comes from rearview mirrors for vehicles.